My research as an industrial design student at the Rhode Island School of Design focused on aqueous ecosystems, and their ability to process waste and clean water for re-use. 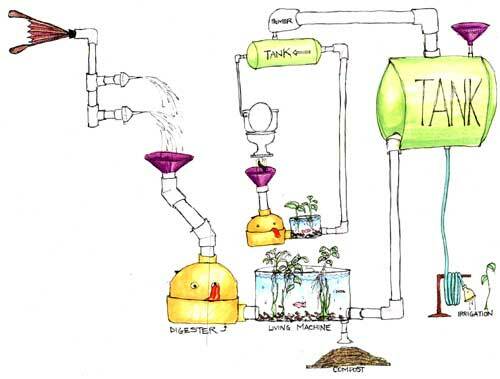 The illustration below is a diagram of an aqueous waste water treatment system that was intended as an educational model for use in one of the building at RISD. This project re-architect-ed the fourth floor of that building for the creation of an 'EcoLab' that would actively process black and greywater from the building for reuse on campus, while at the same time serving as a living experiment that students could test, and run different ecological experiments on. This illustration examines the process of cleaning waste water for an apartment complex. It was a collaborative project between myself, and a student in the RISD Architecture Department. In this case the system converted grey + black water into clean water for re-use in landscape applications, compost for the local gardens, and methane for the generation of electricity to power community centers within the complex. After graduating, I worked with George Chan at ZERI as an apprentice learning his integrated farming systems, and using that knowledge to create educational material for his workshops. I created a PowerPoint presentation for his workshops, and a set of illustrations used in that presentation. Below is one illustration I created of the entire system. Other illustrations broke out these modular building blocks, in context, to examine in detail each step of the process. To view that presentation click here.